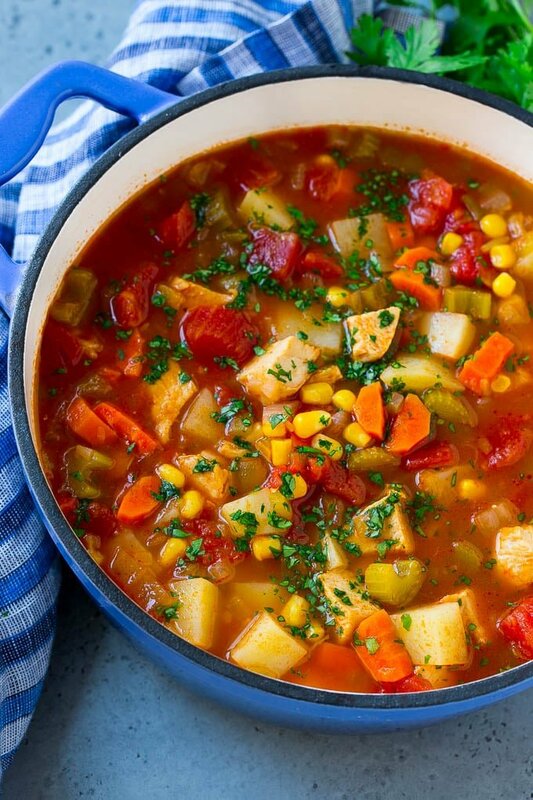 This Mexican chicken soup is tender chunks of chicken with vegetables, chiles and potatoes, all in a savory tomato broth. A great way to warm up on a cold day! I love Mexican chicken soup because it’s full of veggies and bold flavors. Serve it with a side of Mexican caesar salad or Mexican fruit salad for a complete meal. Let’s talk about chicken soup. We eat a lot of it, especially during the colder months. This Mexican chicken soup is warm, comforting and totally healthy with all those great veggies in the mix! It’s a great way to jazz up an ordinary dinner. How do you make Mexican chicken soup? This soup starts out the way so many soup recipes do, with a mix of carrots, onion and celery as the base. The veggies are sauteed until softened and then more flavors are added into the pot. After the veggies are ready, it’s time to add the chicken, tomatoes, green chiles, and taco seasoning. You can use any type of cooked chicken you like such as diced roasted chicken, shredded rotisserie chicken or even just leftover chicken. Diced potatoes and chicken broth go in next, and the whole pot simmers until the potatoes are tender. The cook time on this recipe is totally dependent on the size of your potato pieces – the larger the potatoes, the longer the needs to simmer so keep them small. This soup is not at all spicy as written. If you like some heat, try a taco seasoning labeled hot, or add some hot sauce or crushed red pepper flakes to the broth. I use frozen corn because I always have some in my freezer. You can also use canned or fresh corn off the cob if you prefer. It’s super easy to convert this soup to a crock pot recipe if you’d prefer to go that route. Place some raw chicken breasts in the slow cooker along with the quantities of vegetables, potatoes, broth, tomatoes, chiles and seasonings that are called for in the recipe. Cook for 3-4 hours on high or 6-8 hours on low, then shred the chicken with two forks, top with cilantro and serve. Now that the weather has cooled off, we’re eating soup at least once a week and this Mexican chicken soup is on our regular rotation. Even the kids enjoy it, and I love that they’re getting some veggies in! Heat the olive oil in a large pot over medium high heat. Add the onion, celery and carrots and cook for 3-5 minutes or until softened. Add the green chiles, chicken, tomatoes, and taco seasoning to the pot, along with salt and pepper to taste. Stir to combine. Add the chicken broth and potato. Bring to a simmer. Cook for 20-25 minute or until potatoes are tender. Stir in the corn. Cook for 2-3 more minutes, then top with cilantro and serve. Mexican chicken soup is my fave! Love this recipe. It takes me right back to Mexico. Going to give it a try! Serves 4 but what is the serving size? I made and it looks like it’s more then 4 servings. Need for WW point calculation.its supper yummy! Should be about 1 1/2 cups per serving! Soup was quick and delicious! Skipped the corn and used cauliflower rice instead of potatoes. Blended 1/2 of the cauliflower rice first to thicken the soup slightly. Very healthy and tasty! Thank you! Sounds great, glad you enjoyed it! This is the best recipe,! Easy, fast, colorful and nuticious. I added some diced zucchini and left out the potatoes and corn. We are trying to cut back on the on starches. Next time I may add the corn because it is so colorful. It tasted super meaty and my husband loved it! Definitely a keeper! My family loves anything Mexican so going on the menu this week! I think I can try this recipe. I love soups very much! This recipe sounds pretty good and looks good! I love Mexican food and also chicken so this is a great recipe for me. Yum! I think this is something my whole family would enjoy. I am a sucker for any soup that contains potatoes! My favorite part of fall and winter is all the hearty soups and stews. This soup looks so hearty and delicious! I’m ready for soup weather! We are vegetarians and lately I’ve been struggling trying to make dinner. I need to make a vegetarian version of this soup for my family. I know my husband would appreciate it. This looks so delicious! I will be adding this to our grocery list for tomorrow. Thank you for sharing this recipe. This soup checks all the boxes for me! I love a hearty soup when the weather cools, and pretty much anything soup with potatoes is a winner in my book! How may I unsubscribe? Not personal, I just get too many e-mails! If you’re getting the computer desktop notifications you can go to my site and click on the bell icon on the lower right hand side to unsubscribe.